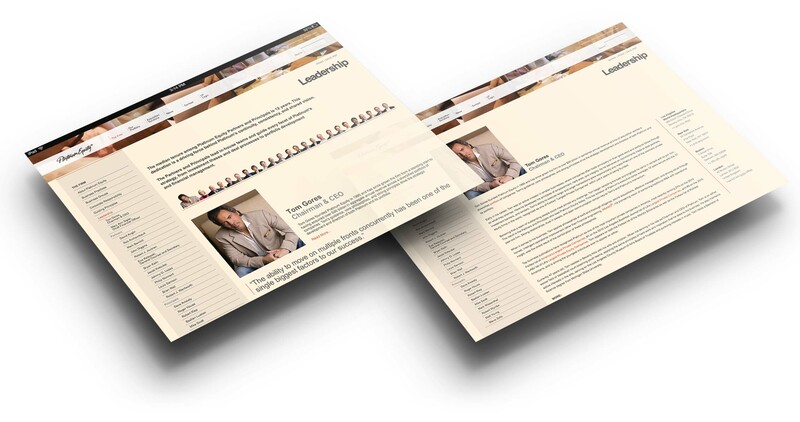 Launched in 2008, we envisioned the Platinum Equity website as a departure from the typical online capabilities brochure. Instead, the strategy was to give Platinum greater control over its story, highlighting the firm’s M&A activity as well as its signature operational skill on a site that functions like a news magazine. Despite being built before responsive design was possible and before WordPress was widely accepted, the site remains online and highly relevant in 2018—a well-amortized investment in the brand. Design, copy, and production; developed in .net with custom content management system. A rich interactive portfolio gives visitors an overview of the scale of Platinum’s holdings, while detail pages detail the portfolio companies' operational activities and successes. Interactive features give visitors rich detail about Platinum’s M&A activity (above), and an interactive leadership page (below) showcases the team in an engaging and unexpected way. A series of video shorts, shot at Platinum’s portfolio companies nationwide, showcase Platinum’s operational strategies and successes. Produced in collaboration with LYON.